All-on-4® treatment concept is scientifically proven with good clinical outcomes with evidence of studies over the last decade. 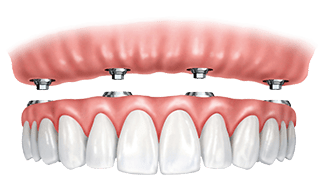 The All-on-4® treatment solution is a full smile restoration that has revolutionized the way surgeons and dentists think of replacing a full set of teeth. Dentures have not been a great success and it is time we get amazing results. Dentures have proven to be painful, inconvenient and unstable. Traditional dentures can make chewing foods difficult by limiting the foods that you can eat. 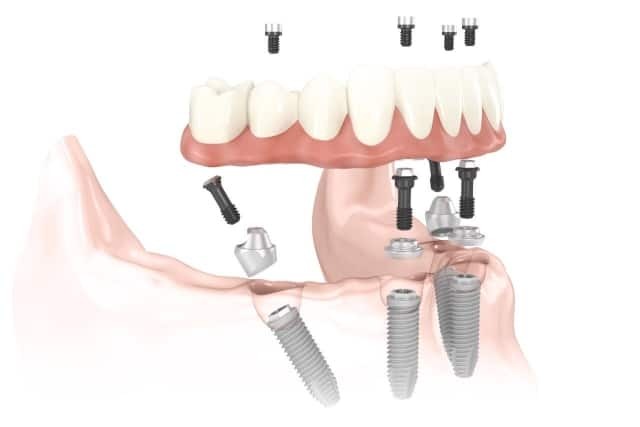 The All-on-4® treatment solution is one of modern dentistry that replaces your missing teeth with a full dental bridge supported by only four dental implants. The surgical procedure includes fewer implants which means a cost reduction. This unique All-on-4® treatment solution ensures greater stability in the bone which greatly decreases the need for further surgeries. Our patients have greatly improved their quality of life and they start enjoying your favorite foods again with confidence. Contact Us for more information or Book An appointment by clicking the button below.